Kodai Lake is located in the Kodaikanal city (Dindigul district) in Tamil Nadu, India. Sir Hentry, then collector of Madurai was instrumental in the initial set up of the lake in 1863. The lake is probably one of the most popular stops at this summer destination. The low f stop (f/22) actuated the star effect on the lights, which I really dig. This is a single exposure, with minimal adjustment on levels. Was really surprised how sharp the shot came out even with a minute long exposure. Looking at the shot really brings back the stillness of the evening – both inside and out. This is beautiful! 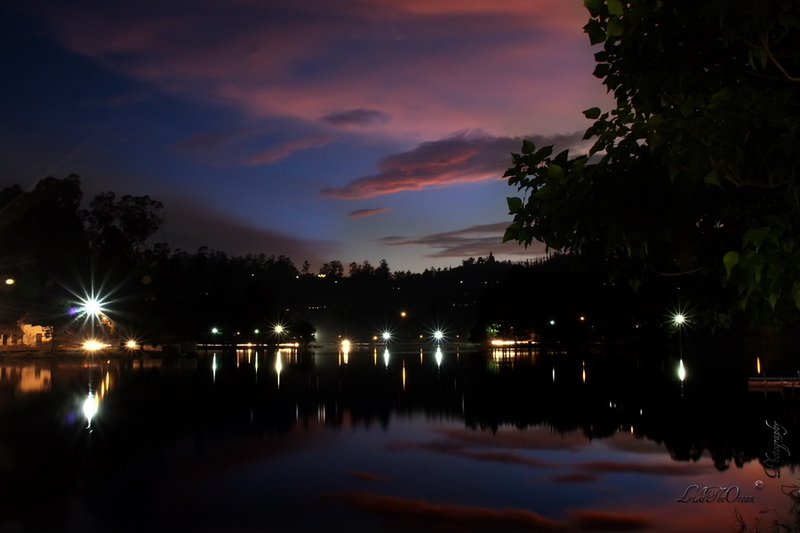 I never thought Kodai Lake could be so stunning. I have to go there now! Great photo- love the star effect on the lights. Great work! Yes Sukanya, Kodai is indeed a wonderful place. U definitely should plan for it soon ! btb u got a cool blog ! nice one. Thanks Deepa ! It indeed was so calm , serene and beautiful ! Wow! Great capture. I love the colors! @Jason – Thanks for the compliments !